If you’ve ever been along to a networking lunch, you’ll know the joy of spending time chatting with other like-minded business owners over a nice meal. It’s a more leisurely approach to networking, and if you find the right group it can be a fantastic source of support and advice. Sian and I regularly go along to a networking group in Brighton – let us know if you’d like to come along as a guest – it takes place at the Hotel du Vin, which is beautiful and cosy, and a great place to meet other local business owners. The lunch is always delicious, but to my mind, it’s hard to describe a lunch as ‘perfect’ without the inclusion of a dessert (a sweet tooth has always been my downfall). At networking lunches, dessert is rarely included, as the event organiser, understandably, prefers to keep the entry price low to maintain high levels of membership. Along comes a Marvellous Marketing idea. My lovely business pal, Kicki Smith recently had the brilliant plan of bringing a sweet treat with her! 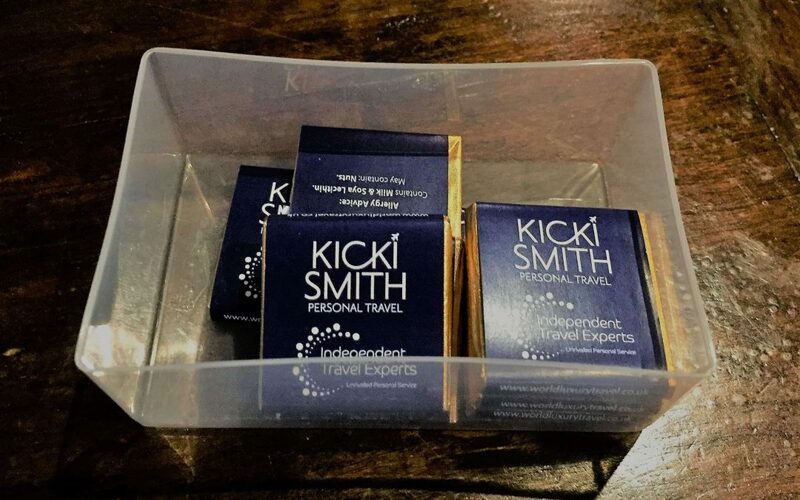 You’ll see a picture of her creation above – delicious squares of chocolate with Kicki’s business branding on the wrapper. She surprised us all by generously passing around these delicious items, to enjoy with coffee, at the most recent meeting. I love this as it’s highly memorable, from the heart, and totally ‘on-brand’ – Kicki’s fantastic travel management services are all about organising the good things in life, just like a delicious square of chocolate.